Listing all posts with label cat champions. Show all posts. This Week's Cat Champions: St. Francis Animal Rescue Center! Our Cat Champions of the Week for August 9-15 are the folks at St. Francis Animal Rescue Center in Rock Hill, South Carolina. 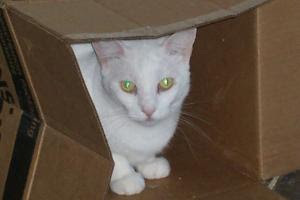 Chrissie, pictured here, is one of the almost 150 cats housed there. St. Francis is a no-kill, cage-free shelter that rescues unwanted, abandoned and homeless cats in the York County and South Mecklenburg County areas, caring for the cats until they can find loving homes. This Week's Cat Champions: TARAA! When you buy your cat supplies and accessories at OldMaidCatLady.com from June 28-July 4, 2010, 10% of the proceeds go to The Animal Rescue & Adoption Agency (TARAA)! TARAA was founded in 2005 for the welfare and protection of animals. 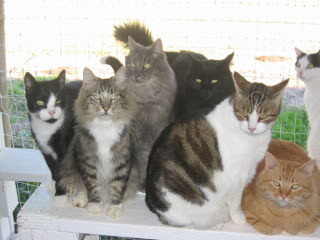 The special folks featured on OldMaidCatLady.com this week are from Belleglen Sanctuary, located in Chico, California. They take in disabled and special needs cats, give them veterinary care and make them available for adoption if at all possible. Since its founding in 1904, the Humane Society of New York (HSNY) has been a presence in New York City, caring for animals in need when illness, injury or homelessness strikes. HSNY has so many wonderful programs for various animals, including its original founding mission of helping the city’s carriage horses, that it’s impossible to go into them all here.